What is Fast Action Ads? 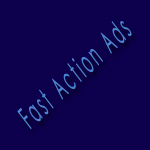 Fast Action Ads is a unique website designed to help you get free advertising to your own website/s. What do I use points for? Points (or credits) are used to spend on advertising at Fast Action Ads. You can use them for a variety of different advertising options, such as Traffic Links, Text Ads, Banners, and Solo Ads! You earn points by viewing the various advertisements at Fast Action Ads. How many points does it cost for my ads to displayed? This will vary depending on the type of advertising you are interested in. All point values are indicated inside the member area. I did not receive my verification email. What do I do? Please make sure to check your spam/bulk filters and ensure the email wasn't automatically deleted. If you still cannot find it, please submit a suppor ticket and we will assist you. I sent a support request, how long will it take for a response? While you will probably receive a response much sooner, please allow 24 hours for a reply. If you do not receive one by then, it's possible our reply was sent to your trash, spam filters, or somehow did not make it to you. Please resubmit your support question in this case.